I don’t know about you but I’m not quite ready to give up the holidays. That’s why Le Merle Saison of North Coast Brewing is Beer of the Month for January. Looks like champagne in the glass, doesn’t it? Well, a little bit. I was given a bottle of this as a Christmas gift. After unwrapping it and thanking my friend who gave it to me, I thought to myself “Haven’t I had this a bunch of times already”. Except for the fact that that I couldn’t remember the last time I had Le Merle, or what it tasted like. 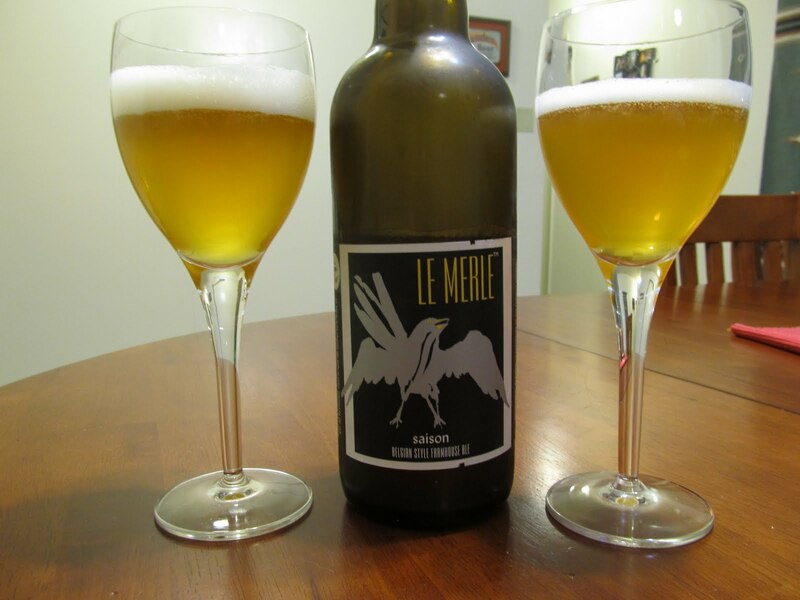 Living in the Bay Area, Le Merle seems ubiquitous sitting on the shelves at all the speciality grocery stores, BevMos!, and better liquor stores and bottle shops. And so seeing it so often when buying beer created this odd familiarity, where the beer was some sort of friendly acquaintence in the beer aisle that I really didn’t know. It was time to change that. And getting to know this beer was more difficult than I expected. The taste is difficult to define. There’s this light earthy yeasty background, with a bunch of crisp light fruit flavors mingling in the foreground sort. Is it pear, pineapple, lemon? I can’t really tell for sure. It’s very dry, with no sweetness at all. Which is what I really like about Le Merle, it’s unique and hard to define while avoiding to taste cluttered and muddled, always the sign of a great beer. Besides, if I wanted well defined fruit flavors in my drink, I’d just go down to Jamba Juice, order a smoothie, and pour vodka in it. It’s lightly earthy, yet crisp. Clean yet complex. A beer that could pass for sparkling wine if you aren’t paying too close attention. A contradiction of flavors, a last gasp of the holidays, and Beer of the Month.